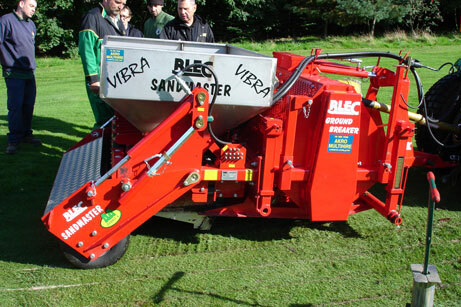 The BLEC SANDMASTER is a unique, one-pass, surface draining machine that�s designed to work on a wide range of sports surfaces where compaction and drainage is a problem. The BLEC SANDMASTER is a quick fit attachment that connects onto the BLEC GROUNDBREAKER via rear pins and a front drawbar. This system allows the use of smaller tractors because the weight is transferred onto the rear wheels of the SANDMASTER. Golf greens, atheletic fields, and more can benefit from the SANDMASTER system. 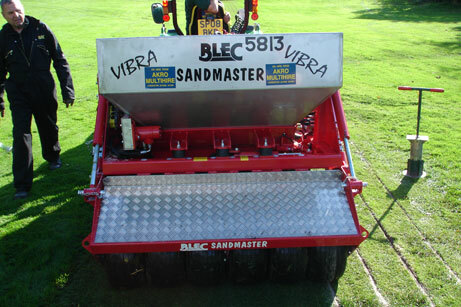 The BLEC SANDMASTER concept is simple. The SANDMASTER is mounted to the rear of a standard GROUNDBREAKER which is equipped with special curved, long,wedge-shaped blades that penetrate even the hardest of ground. The blades cut a continuous slit and also move the ground laterally between the slits, relieveing the compaction across the full width of the machine. 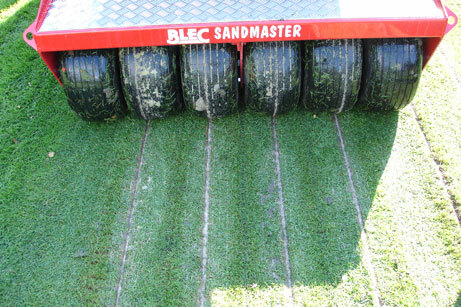 The GROUNDBREAKER runs on wide flat skids to hold the turf down flat with no surface disturbance. 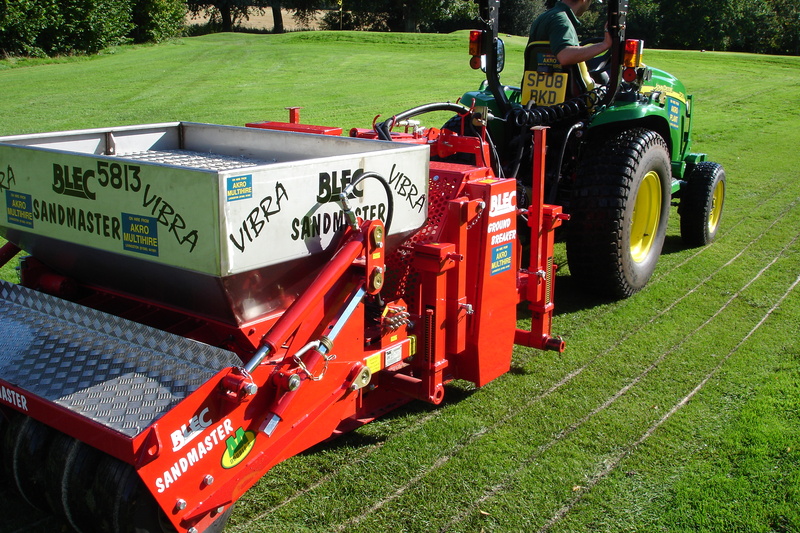 Then the rear-mounted SANDMASTER is equipped with 1� wide coulter tines which open up the slit produced by the GROUNDBREAKER blades,down to a depth of 4�- 8�. A stainless steel sand hopper is fitted with twin rubber-coated powered rollers, and an agitator rotor. The feed rollers are adjustable for gap and speed to allow a wide range of materials to be spread, like wet or dry sand, gravel, lytag, clay profile compost, polymers, etc. A unique vibrating displacement hopper divides and directs the sand material down into the slit trench. Vibration speed is adjustable to allow either wet or dry material to be used, and the hopper is equipped with removable �V� shaped plates for working with various materials. A row of compression steel wheels and scraper plates press down the material into the slit, eliminating air or cavity pockets. Then, finally the process is completed by a row of floatation tires that roll the surface level. A side wheel is fitted standard for stability when working on contours.